Sailing from country to country, you become well acquainted with officialdom in its various forms. You learn how to greet officials with a friendly hello -- and with a stack of photocopies: passports, crew lists, boat documentation, exit papers from your previous port. For each port you enter, there is a dance you must learn, stepping gently from one office to the next. There are appropriate moves you adopt, always beginning with the greeting (often quite formal: a bow, perhaps). Each place has its own style, and quirks. A smile goes a long way in any language -- but you have to know how to dance by local rhythms. In Mexico, for example, we learned that the Port Captain was the most important official -- and the one who led the dance -- in each town. Having a baby in Ensenada was enough to teach us about pacing when it came to the Mexican cha-cha and its various movements. Sometimes you pick up the beat and meet deadlines -- Cha-cha-chá! -- but mostly you have to turn in all the proper forms, with multiple copies going to multiple offices, and, well... wait. In French Polynesia, we tangoed back and forth between Immigration, Customs and even the bank, as the bond (a deposit required upon arrival and returned upon departure) was a key stipulation for entry. The Cook Islands and Nuie were easy enough -- requiring patience and a knack for slowing down the pace, a quiet waltz through dusty concrete offices with friendly fragipani'ed agents. I don't recall Tonga, to be honest, but by the time you reach there, you've gone through the drill enough times to bring multiple copies of all your papers and to be prepared to take your time. New Zealand is perhaps the most efficient place we've ever sailed to, despite the metaphorical slap and note in our official entry file for dropping our anchor for a few hours just outside the harbor entrance to await daylight, opting not to arrive in an unfamiliar harbor at an unfamiliar Customs Dock in the dark. 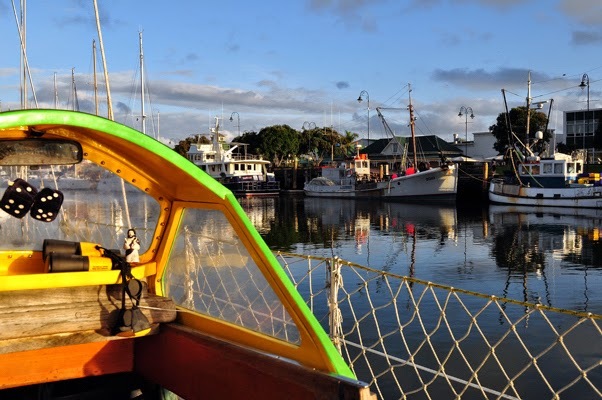 In New Zealand, administration runs like clockwork, and even getting our residency, while a lengthy process -- a very slow dance, you might say (with two offshore trips, one to Fiji for a season and one to the 12-mile-limit off the coast in order import the boat as residents, once all the papers had been properly filed and accepted) -- was straightforward enough. Even the tax department is easy to work with (and, in the IRD offices on Bank St in Whangarei, they smile). Indonesia was another matter altogether. Prior to sailing there, we sorted our visas with a trip to Suva, and, via an online contact in Jakarta, I secured an 'agent' who became our 'sponsor' and helped get our Cruising Permit -- the infamous CAIT. To say the paperwork in Indonesia is cumbersome is an understatement. The check-in and check-out processes made all the paperwork required for giving birth in Mexico look like child's play, and the ease with which we obtained our visas in Suva was no indication of what was to come. The offices in Indonesia share some characteristics with those in Mexico, and remind me faintly of encounters some decades ago in East Germany: they are dimly lit with fluorescent bulbs; they are smoky and poorly ventilated; they usually have one fan whirring away in the corner, with little or no effect; and there are always a bevvy of officials with impressive uniforms -- not exactly bustling, but doing a kind of indecipherable shuffle, as they open drawers, examine files, sigh and eventually sign and stamp an approval. We were helped with our check-in by Mr Budhi from the Tourism Ministry, who ushered me on his moped from Tual's Port Captain to Immigration to Customs. Half the time I had no idea what was being said, of course, so I settled into a relaxed position (in a somewhat dozed state after having been sick at sea for a week with salmonella) to observe just how they get the job done. Not many boats arrive in the eastern parts of Indonesia, and few boats had checked into Kai Island before our arrival. 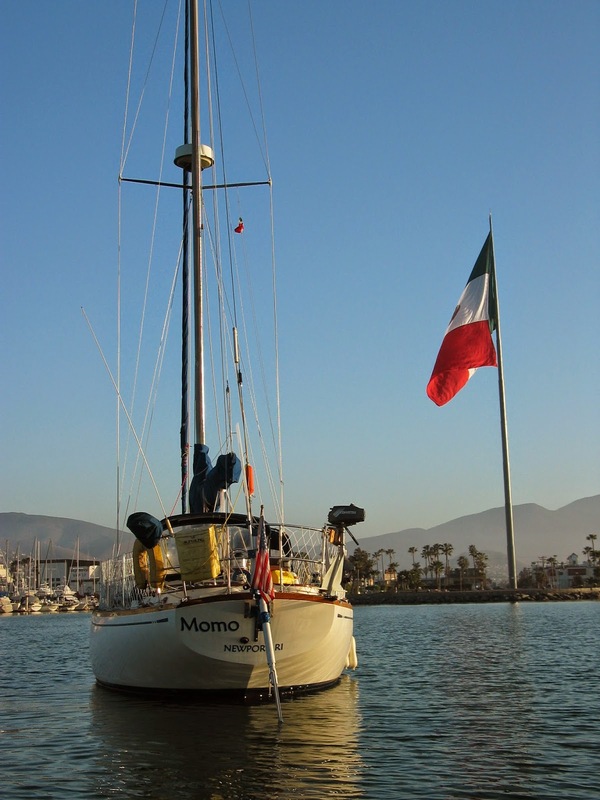 Lucky for us, one boat had preceded us by a week -- S/V Morning Glory -- and apparently the easiest way for Customs to deal with our arrival was to copy their information onto our forms. I watched over the shoulder of the official entering data on his screen. Wait... In my dozy state, I thought: Morning Glory is a catamaran. Same flag, same length, but displacement? Not sure about that. Stop. My turn to step in and lead. Gently, gently, I pointed out that they would have to change the owner's name, and a few other details. Oh ya, ya, ma'am. I leaned over the keyboard and peered at the screen while the Customs official typed in the next set of papers -- and had to do the same again: Change name here, and here. No, not Mr. Hoag. Me. And here. Not Morning Glory. Change to Momo. Here, here and... here. Hoag, no. Elvy, yes. And now, your stamp. Boat stamp, ma'am. We had met Morning Glory on anchor in Debut the day before -- they were the previous boat to arrive in these parts, remember. They had greeted us with cold beer and snacks and advice about checking in. This included prepping us about the Boat Stamp: an official stamp with boat name, flag, registration number, captain's name, and signature line. We did not have such a stamp. But, armed with the advice from Arthur and Amy on S/V Morning Glory, I managed. When it came time to stamp my papers, one photocopied paper after another, I pulled out the stamp we had dug up in haste late on the previous night, in a cupboard of toys and games. It did not say S/V Momo; it did not have the boat registration number or the captain's name; it did not have a signature line. But it worked. 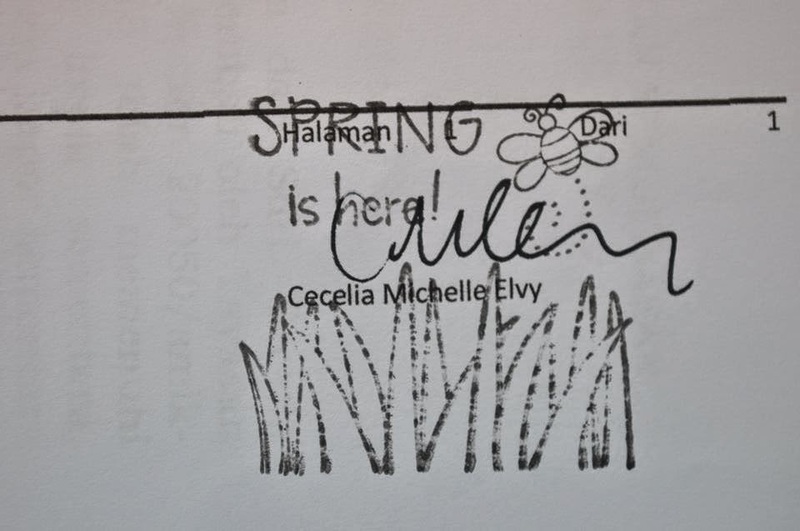 I stamped over and over and over, with aplomb: Spring is here! And signed my name right above the wavy grass. And smiled and bowed and thanked them for the dance. Oh just noticed your comment today, Behan! I love that Ensenada morphs into Serenade. Funny.